Pure ignorance, that's what it is. IF the Nazis didn't murder anyone, how do you explain this? In 1941, as news of the T4 programme leaked out there were protests and opposition. On 3 August 1941 a Catholic Bishop, Clemens von Galen, delivered a passionate sermon in Münster Cathedral attacking the 'euthanasia' programme, which he described as ‘plain murder.’ He spoke of a terrible future for humanity if 'euthanasia' became an acceptable for those perceived to be weak. Lie. It is common denialist tactic to lie that there is no other evidence that mass murder took place. They do that so they can cope with the cognitive dissonance of there really being no evidence for their belief millions were transited back out of the AR camps and resettled by the Nazis, until they were liberated by the Allies. Another falsehood. Hilberg has over 3,400 footnotes - just 4 cite Wiernik and none cite only Wiernik. Out of curiosity, how many times have you read Hilberg's 3 volumes? Saggy has long since given up any pretence of debating honestly (as if a Holocaust Denier is even capable of honest debate any way). Now he just repeats debunked, demonstrable lie after debunked, demonstrable lie. Morgen wished to investigate murders in the camps, which he had learned of in his various inquiries, and did so to some extent, only to be - as noted above - subjected to a tirade from Gestapo Müller and eventually reassigned by Himmler. was not at all surprised that there was an extermination of the Jews, that there were inhuman treatments which had been ordered, and he said to me, ironically, "Why don't you arrest me[?]" Of course, I did tell him, I did tell Oberfuehrer Bender because he was a judge who reported to the Reichsfuehrer-SS directly, and he also consulted him. I also told the Chief of Main Office SS Court, Obergruppenfuehrer Breithaupt. I can state under oath that both personalities were horrified to hear about those things. I am a man who studied in all sorts of fields, and I was quite familiar with International Law, and about principles for all the laws which existed for all the legal countries, and that is the reason why I left no doubt that if a State committed such crimes, that those things can have a dire and horrible result against the State as such. And I am positive as a result of my investigations that I was able to [show] with concrete cases that the agents which were used for the bloody practices became absolutely criminals. Absolutely putrid. Morgen's testimony is not helpful to deniers. I must share with readers that some years ago, vigorously denying mass murder at Majdanek and in the Einsatz Reinhard program during discussion of Morgen at AHF, Saggy wrote of Globocnik - and I kid you not - "So, this is quite a character, and I had never heard of him." In the same thread, Saggy also wrote, "this is the first time I've read anything about Belzec." Unsurprisingly, Saggy's ignorance of basic facts did not stop him from pontificating at length about Majdanek and Einsatz Reinhard and "ENTIRELY WORTHLESS" testimonies and evidence about the Nazi camps. Last edited by LemmyCaution; 21st September 2017 at 04:28 AM. No, anyone who studies any of the witness testimony will quickly discover that it isn't. See how easy and ridiculous it is when you construct an argument based on say-so alone? Are you attempting to establish some kind of record for number of lies you can rack up in just one post? Morgen's career demolishes the holohoax. And his testimony is a slightly weird bag, but deniers love it. Morgen was tortured and threatened at Nuremberg to implicate Isla(?) Koch, but refused. He testified that Buchenwald was a great place to be with many amenities (I'm not going to look it up right now), and he testified that there was a Jewish wedding party at one of the Reinhard camps. Then his testimony veered off for a bit, and he testified that the Jews were responsible for the hoax as they were the ones who implemented it, and that there were gas chambers at Monowitz. The only explanation for these absurdities is that Morgen had to give something in exchange for his life, but insisted on protecting the SS. I've read Morgen's testimonies and you are butchering it, lying again Saggy? Of course, if you have indeed read Morgen's testimony, you would also know he also stated that Reinhard camp was exterminating Jews. Whoops, forgot that part did you? Last edited by Dash80; 21st September 2017 at 06:51 AM. I read the condensed version. Citiing Wiernik is equivalent to citing Irene Zisblatt. And the 'crucial' eyewitnesses, Rosenberg, Meuller, Vrba & ?? ?, are no better. Just complete idiocy. Which, of course, is why my challenge to name one credible Jewish eyewitness and summarize/discuss their testimony, along with any corroborating testimony, and and physical or documentary evidence that supports the testimony, goes unanswered (except for link farms of course). Last edited by Saggy; 21st September 2017 at 06:54 AM. I didn't forget, mentioning that Morgen said that the Jews ran the extermination program (and not the SS) (in the Reinhard camps). Just completely absurd. It's in the avalon library and easy to find. Are the Nazi eyewitnesses credible? Do you accept their testimony? Yeah what about Rudolf Höss? How about you stop being dishonest with your "interpretation" of testimony and give a direct link to Morgen's own words? EDIT: Unsurprisingly that's not what Morgen actually said at all. Shocker. Last edited by Dash80; 21st September 2017 at 08:19 AM. Surely we can trust the words of an SS officer. More dishonesty. Tell us the number of Jews said by Hilberg in 1961 to have been murdered at Majdanek. You don't want to debate Majdanek with me. Just sayin'. Even more than you don't like debating other aspects of the Holocaust with me. Btw when he gave up on denial Black Rabbit of Inle - who went so far as to make a dishonest and error filled video about me on Majdanek - came to accept that gassing of Jews occurred there in the bunker north of building no. 41. He also gave up on Eric Hunt's botched account of the bathhouses and bunker. If you can present one credible Jewish eyewitness and discuss their testimony, along with corroborating testimony, and physical or documentary evidence that supports their testimony do so. Does this mean that for you, nazis eyewitnesses, along with corroborating testimony, and physical or documentary evidence are not credible? Claiming this photo is evidence of the hoax is pure idiocy. Way beyond rational comment. It shows simultaneously the chutzpah and the desperation of the hoaxers. As a matter of fact a single photo will never make an evidence. The problem for you is that there is much more than a single photo. There are hundreds of photos (and even movie footage) much more explicit that this one which clearly show mass murders. If this would not be enough there are also thousands of nazis documents who show beyond any reasonable doubt that the nazis have mass murdered millions of Jews. And the mass graves that can still be found in Ukraine, Belarus and other placeS. To which one can also add the radio communications of the Orndnungspolizei and other SS units (including the Einsatzkommandos) intercepted during the war by the Brits which confirm that there were mass murders on the East front. Finally all these material evidences are confirmed by numerous testimonies of victims, executioners and other witnesses. If you had just a little bit knowledge of the History you would know that. But all what you have managed to achieve so far is to prove us that you are an ignorant idiot. He doesn't actually read anything or respond to what is written. I hate to say it but it looks like he transmuted into a troll and is not a serious person trying to debate something. You don't want to debate Majdanek with me. Just sayin'. I don't want to debate anything with you ! However, you're practically the only non-zero content poster among the hoaxers, so, I gotta live with it, otherwise I'd be talking to myself ! 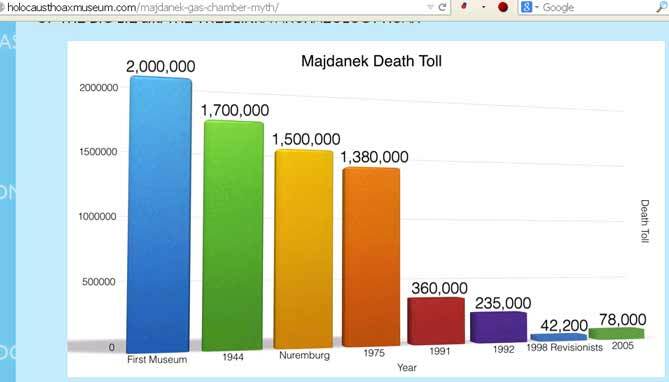 But, there is no more hoax at Majdanek, the numbers for the museum and the 'revisionists' are about the same. What do you know, they used the camp records and came up with comparable numbers. Nothing to debate unless you want to come with a few idiotic lies out of pure habit. 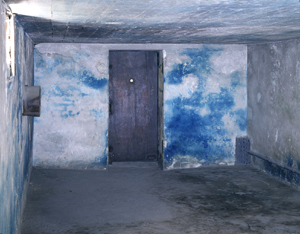 The only bad news for the deniers is that we can't point out the absurdity of the hoax gas chamber at Majdanek. Another gas chamber with a window, not to mention openings for the DeGesch(?) fumigation equipment, not to mentions a gas chamber withing a gas chamber. Totally dissected by Hunt in his Majdanek vid. There is way too much data at Auschwitz too, and the records are now public, so the hoax there is on its last legs. Saggy, what about Rudolf Höss? The degenerate absurdity of the hoax is well illustrated by Hoess's torture and 'confession'. Hoess was by his own account the grand architect of the hoax, working with Eichmann to find a method of killing the Jews, etc. Yet he was not tried at Nuremberg, he testified as a defense witness ! How freaking absurd can it get? At the trial his affidavit was read into the record in which he 'confessed' to gassing 2 million Jews and killing another .5 mill by other means. "I was treated terribly by the [British] Field Security Police. I was dragged to Heide and, of all places, to the same military barracks from which I had been released eight months before by the British. I do not know what was in the transcript, or what I said, even though I signed it, because they gave me liquor and beat me with a whip. It was too much even for me to bear. The whip was my own. By chance it had found its way into my wife's luggage. My horse had hardly ever been touched by it, much less the prisoners. Somehow one of the interrogators probably thought that I had constantly used it to whip the prisoners." The fact that Hoess's 'testimony' is still cited as evidence of the hoax indicates the chutzpah and total depravity of the hoax establishment. These people are liars the likes of which the world has never seen. Last edited by Saggy; 21st September 2017 at 12:14 PM. Clearly you don't want to debate, or even discuss, with anyone here. You didn't answer my question about Hilberg. Noted. There is no gas chamber with a window at Majdanek. I don't want to debate anything with you ! Then WTF are you here? However, you're practically the only non-zero content poster among the hoaxers, so, I gotta live with it, otherwise I'd be talking to myself ! Saggy, I'm perfectly willing to have a conversation with you.....but you need to respond instead of posting more goofy pictures. His testimony matches other testimony, also he was apparently comfortable enough to discuss his treatment by the British quite freely. Does not sound like someone who was forced to tell lies to me. The Höss almost-discussion reminds me that Saggy owes us an account of the torture of the Einsatzgruppen trial defendants. Indeed there was a link to something I wrote for HC blog. Yes, you'd have to be willing to know about Krzepicki and Rabinwoicz - or to read that piece - to have anything to say about their testimonies. No, you don't want to hear which witnesses people posting here find valuable and why - which must be why you refuse to discuss Krzepicki and Rabinowicz or even read what I've said about them. Last edited by LemmyCaution; 21st September 2017 at 03:26 PM. Meaningless snark - you're still dodging the challenge, and not just about Krzepicki and Rabinowiciz, but also about Sacowicz, Schmid, Szmajzner et al. He lost the argument months ago, he's just trolling now. His position is that anything that is evidence of genocide are lies. So basically he demanding information he has already pre-dismissed, so he can deny it again. Pretty much just trolling now. 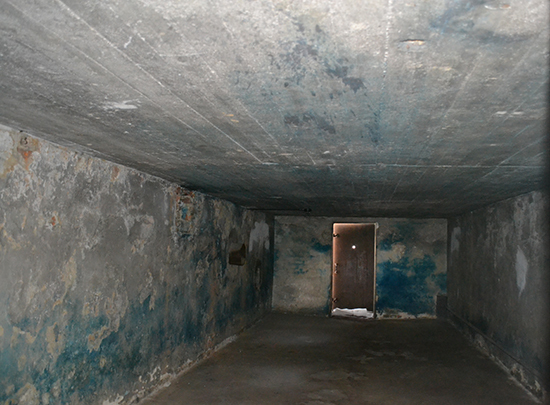 A question that also arises is WTF we are here.
. . . the absurdity of the hoax gas chamber at Majdanek. Another gas chamber with a window . . .
And just one more laugh from Holohoax101. And just to show the good old window from the inside of the gas chamber. And here is the link if you want to see the inside of the gas chamber here. I adjusted the size of the photo with the red arrow from what D-H posted at SSF so it'd fit here; the words inside the red arrow read, "This is the so-called window of the Majdanek Gas cham[b]er… in reality its a light"
. . . it's a little suprising that you'd bring up my prior comments on Majdanek, the one camp I've visited, by chance before I was a denier, since the hoax has completely collapsed there . . . I asked Saggy for Hilberg's 1961 estimate for the Jewish death toll at Majdanek. Saggy didn't answer - Hilberg's estimate ruins the misleading story he tried to tell with a graph which omitted Hilberg's estimate - or any estimates of Jewish deaths. So what did Hilberg calculate in 1961 as the number of Jewish deaths at Majdanek? minimum 50,000. Similar to the estimate of Scheffler (1985) 50-60,000. There's no doubt that there has been disagreement over the death toll at Majdanek, including the number of Jewish deaths; there is also no doubt, however, that there has not been a steady progression of lower estimates of the latter - rather, there have been disagreement and research to resolve that disagreement. The museum's current estimate of 60,000 Jewish death includes gassing and shooting killings described in Kranz's book, The Extermination of Jews at Majdanek Concentration Camp. Finally, Saggy's "revisionist" number is universally rejected, with Kranz estimating about double that number of total deaths at Majdanek. Last edited by LemmyCaution; 21st September 2017 at 07:20 PM. What evidence would cause you to believe the proposition was true and valid?